Not everyone wants to smell like a Catholic cathedral in the middle of Midnight Mass, but I do. Maybe it’s because I’m not Catholic, but incense’s associations, for me, are less religious than architectural – and sensual too, since it’s one of those addictively overpowering fragrances that drive you slightly out of your mind (which of course was the original intention). The smell of incense is almost certainly among the oldest perfumes we have, with a history that stretches back as far as the word itself – the Latin ‘per fumum’ means ‘through smoke’. The word ‘incense’, meanwhile, derives from ‘incendere’, which also gives us ‘incendiary’ and ‘incinerator’. Burning incense of one kind or another is common in many ancient cultures around the world, but the Catholic version began life in Africa and the Middle East. Lumps of incense have been found in the tombs of Ancient Egypt, and its main ingredients – frankincense and myrrh – still come from the Yemen, Oman and Somalia. Recreating the burnt, resinous smell of incense in a perfume must be difficult, but in the last decade several perfumers have made the attempt, and Avignon, to my mind, is among the most convincing. It’s strong stuff, and not everyone will like it, but I love its almost narcotic intensity, with the pungent yet herbaceous smell of sun-burnt shrubs (especially cistus and santolina) on a rocky Greek mountainside. I don’t know if it’s simply the power of association, but I can even detect a hint of the slightly mouldy dampness that so many old churches smell of. 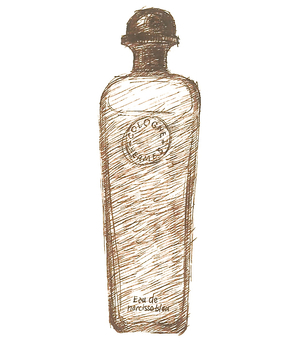 Launched in 2002, Avignon was created for Comme des Garçons by the brilliant French perfumer Bertrand Duchaufour, known for his long-standing association with L’Artisan Parfumeur. The name might seem a bit of a puzzle, until you remember that Avignon – now a beautiful if touristy walled town with tedious suburbs – was the seat of the papacy from 1309 to 1376, after the election of a French pope who refused to move to Rome. And ‘Avignon’ is surely a more evocative and intriguing name for a perfume than ‘Rome’. I, for one, am a willing convert. Pretty much everyone I know loves Hermès’ deliciously fresh and zingy Eau d’Orange Verte, so when Eau de Narcisse Bleu (literally ‘blue narcissus water’) was launched in 2013 it had a tough act to follow. As I’ve never seen a blue narcissus / daffodil, I think it’s safe to say that this perfume has an element of fantasy about it, and as a smell, too, it’s perhaps rather more complex and a little less instantly accessible than its predecessor. But give it a little time and I think it’ll grow on you. 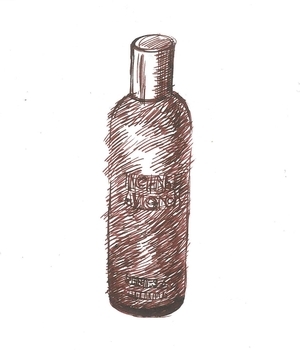 Now, I have nothing against smelling of hay, which is a lovely scent in its own right, but what Hermès’ much-mythologised perfumer, Jean-Claude Ellena, has done is blended the smell of hay with a whole raft of subtly complementary fragrances. Most of them are quite ‘green’ – that is, they smell fresh and natural, like grass and leaves, but not especially sweet or flower-like. To me it has a slight but definite scent of fig-leaves, which for anyone who loves L’Artisan Parfumeur’s wonderful Premier Figuier as much as I do can only be a good thing. Whether this figginess is (excuse the pun) a figment of my imagination I’m not sure, but among the other ingredients that Ellena lists is galbanum, which is extracted from the root of a wild Iranian plant that looks a bit like fennel or cow-parsley, and indeed is distantly related to them. Galbanum has a marvellously fresh sappy smell like newly-snapped pea-pods, and is one of the most important components of ‘green’ perfumes, but its greenness, here, is tempered by the hay-like sweetness of narcissus, with a hint of earthy bitterness underneath which manages to stop it from smelling at all girly. If my description makes it sound a bit complicated, don’t be put off, for it’s such a well-blended perfume that there’s nothing discordant about it. In fact if anything it is, perhaps, a little too gentle for its own good, as it’s a ‘quiet’, thoughtful scent that stays close to your skin and doesn’t, on the whole, grab other people’s attention. It’s discreet and refined, in other words, rather than a ‘look-at-me’ perfume, which is perfect if you want to smell good without drawing attention to yourself. Go try it. * I say ‘narcissus extract’, but one of the irritating things about perfume marketing is how vague – and frankly clueless – most descriptions of perfume ingredients actually are. For as anyone who actually grows the things themselves knows full well, a bright-yellow daffodil like Narcissus ‘February Gold’ smells very different to Narcissus papyraceus, the so-called paperwhite narcissus; the former has a gentle, hay-like scent, while one of the big selling-points of paperwhites is their powerful, almost jasmine-like perfume, the sweetness of which, en masse, can have a touch of the slightly repellent stagnant-water smell that perfumers refer to as ‘indolic’. If only perfume PRs were taught some basic botany. Postscript – mystery solved, but only by going to the source: in France last week I visited IFF-LMR, the legendary natural raw perfume materials company near Grasse, and what should we get talking about but their narcissus extract, which is derived from the beautiful Narcissus poeticus, fields of which grow wild in the uplands of the Lozère. Did they use other species of daffodil as well? No, came the answer, and it’s their extract that you’re smelling (among many other things) in Eau de Narcisse Bleu.